Plant type: A low-growing herbaceous ornamental perennial, originating from Mexico. Light: Prefers full sun though can tolerate partial shade. Blooms prolifically if planted in areas that receives the most sunlight. Moisture: Medium to low water requirement. Can grow in both dry and wet conditions. Soil: Though tolerant of high heat and humidity, it grows best in standard moist soil. 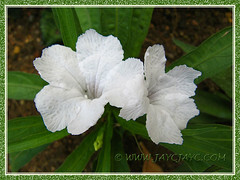 A versatile plant that thrives in any kind of soil, be it acidic, sandy or clay. Propagation: By dividing its rhizomes (root ball) or from herbaceous stem cuttings that root very easily in moist soil or seeds, though it’s better to let it self-sow which it does quite aggressively. 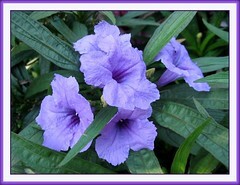 Features: Katie Dwarf Ruellia is a dwarf herbaceous version of the Mexican native species. It grows vigorously into clumps that are about 8-12 ins. high and as widespread, differing from the native species which reaches 2-3 feet tall. Its linear, sword-shaped leaves measuring 4-5.5 ins. long and 0.5-0.7 ins. wide are deep-green in color with a metallic bluish tinge, almost hiding the stem that holds them. Clusters of brilliant purple or bluish purple trumpet-shaped, petunia-like flowers about 1.5-2 ins. wide are borne at stem tips. A prolific bloomer throughout the hottest seasons, it is absolutely stunning indeed! Care: Very low maintenance plant that does not need deadheading and is hardly bothered by serious insect or disease problems. Very occasionally bothered by snails, caterpillars, mealy bugs and white flies though, so an occasional check on the underside of leaves or bud clusters are advisable to prevent any spread if any. 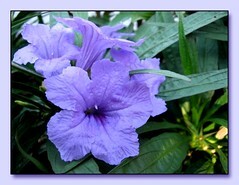 Ruellia brittoniana ‘Katie’ being a dwarf variety needs no pruning. If the colony of plants gets too big over time, just remove stray or excess plants by cutting straight into the root ball with a spade, dig and discard them. Preferably, grow them in hot and sunny areas to result in the most blooms. Usage: Being compact and low-growing, this Dwarf Purple Ruellia will be perfect as a front-of-the-border grouping in flower beds or groundcovers! Also, excellent for container gardening to brighten any garden spot or landscape with their colorful and plentiful blooms. Not excluding their great attraction to butterflies and bees! For sub-tropical & temperate regions: Check here! Dwarf cultivars come in colors of white and pink, besides purple! 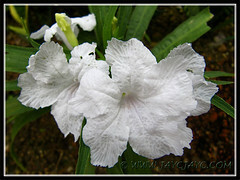 The white version of ‘Katie’ is known as White Katie Ruellia with white flowers. 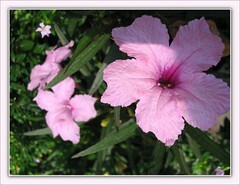 And, the pink version of ‘Katie’ is known as Ruellia brittoniana ‘Bonita’ or ‘Colobe Pink’ with lovely soft pink flowers. I have purchased the Ruebellia shrub and want to know sun or shade, or both or particial and do they need cutting to the ground just before springtime as Butterfly buses do? 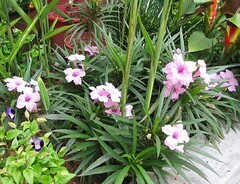 I live in Jupiter, Florida, and I have been trying to find without success where I can purchase the purple, white and pink “Katie” dwarf Ruellia. Can you give me any ideas? For some reason, the local nuseries have all stopped supplying Ruellia – something about it being invasive. But for the application that I have in mind (borders along a cement pathway) I think they will be perfect. Any suggestions as to where I might purcase the plants would be much appreciated. Thanks. Beautiful website. Great info., especially on the “Katie”. Thanks so much! Thanks a lot for your kind comments and appreciation, Jean! Our pleasure in sharing. I have the tall growing variety of Ruella and one of the plants seems to be growing strands and wraps itself around it’s stems like it is trying to choke itself. I pulled some away but it came back. The plant is no longer flowering like it did. Help! 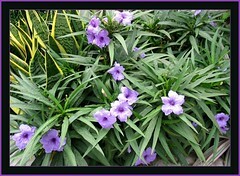 Hi, I live in West Palm Beach, Fl, I am looking to purchase some of the dwarf ruellia but have not been able to find them. Any suggestions as to where I could purchase them, it is for a cement boardered flower bed? Thanks! Just found Dwarf Ruellia at Houston Garden Center. I live in Texas. I got the blue, white and pink. 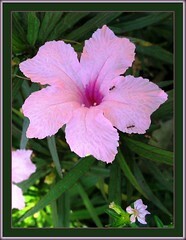 I live in Arizona and have 5 ruellia brittoniana .3 of the 5 are growing upright. The other 2 vines are drooping to the ground almost like the vines are too heavy. .I didn’t want to start pruning. This is the first time in my life owning this type of plant. All comments would be appreciated.